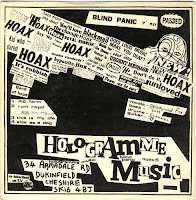 Short sharp kick in the teeth: # 247 The Hoax - Blind panic E.P. # 247 The Hoax - Blind panic E.P. Fourth and final record by this Manchester/UK punkers. A great record ! Read everything here and here.